The + Lion blog is where we share news & views regarding the web and accessibility. We also use this space for event writeups and to share details of side projects and distractions. I started building websites over 10 years ago. Over the years i have worked for an amazing set of clients and on amazing projects. About a year ago i rebranded my company to + Lion and started concentrating on accessibility related work. Today, i started on a new path. While i have enjoyed + Lion very much i had decided that it was time to move on and to develop. An opportunity had arisen for me to join the BBC as a client side developer (front end developer!). This morning i accepted that position. I’m super excited about working for such an esteemed organisation who really are leading the world. In areas such as embracing digital technology in broadcasting and news gathering. I will be working with the On Demand team contributing to the development of on demand offerings such as iPlayer. I would like to thank the amazing people who have guided me over the years. Alun Rowe, Richard Quick, Bruce Lawson, Henny Swan and Anthony Kennedy have supported me and encouraged me to better myself. Thank You. Excited is an understatement, i simply cannot wait to see what the future holds. Chrome & Autism: First impressions of using chrome as my daily browser. When chrome first debuted on the web i was not all that impressed with what it offered over my normal browsers of choice Safari and Firefox. While it offered lightning fast loading it missed a few key features which i felt i required in order to go about my day to day online activities. Principally it would not function with voiceover, offered no facility for me to change default colors and it felt awkward to use. Recently i came back to Chrome, swapping Chrome for safari on my dock in an effort to see if i could live with it for a week. I was looking at alternatives to Safari as the default color reset options are not easily accessible and its scrolling performance on complex sites has much to be desired! This short article provides a quick summery of my experience with a tilt towards the accessibility and some thoughts on on where i could see Google going in the future. The bad and the ugly. Chrome and VoiceOver. Chrome and VoiceOver is a train wreck, i will write a more in-depth article on the issue in the future but after much prodding, poking and trying i just cannot get VoiceOver and chrome to play nicely. I have been unable to find any form of Rotor in Chrome such as supported by Safari. A rotor allows you to see & select elements of the page listed by type (headings, lists, images, forms etc). This is a great way for understanding a visually complex page with low strain for me and something i required in my day to day browser. While Chrome is getting better with VoiceOver (its now possible to open and close tabs, select screen buttons etc) its not yet challenging Safari in this area. However, when it comes to my specific use case Chrome has replaced Firefox in a key area, browsing with non default background and text colours. I have been using Firefox�s preferences to override the default text and background colors for a while, and while it works there is no easy method to toggle between the custom and default states. Chrome however, has a nice extension for this, it allows me to swap defaults with a single click and it sits right on the very minimal toolbar. The minimal look of Chrome is something that i have taken time to grow use too. A reason for using Safari over Firefox outside of voiceover support is visual complexity. I find visual complexity difficult to deal with. Generally i would zoom into the screen (screen zoom) so that my view port was limited to only the content i wanted. Safari is visually less complex than FireFox (even FF4), and Chrome is visually less complex again. For me this means less strain when reading and a generally quicker less confusing experience. So thats about all, for this post. Over time i am sure my opinion will change and develop. 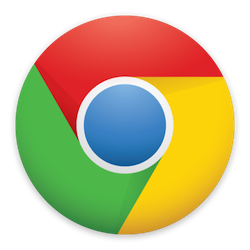 Right now, i think Chrome will be replacing Firefox as my 2nd browser (after Safari) but i�m excited to see how Chrome develops into the future. One of the purposes behind writing this blog was to have a place to share some of the little things we do at + Lion that we don’t normally tell people about. These side projects are vital to keep our skills sharp as they allow us to play with ideas and techniques without risking to much client time. Often, a side project pops up when we have a need to solve, Bouncer came about when I felt I needed a better iPad browser homepage. Unlike Opera’s Speedial, Safari’s Top Site and Google’s pinned sites, Safari mobile does not provide a visual home-screen. For bouncer I decided that a few handy links (BBC News, Engadget & Daring Fireball) and some information about the weather would be nicely supplemented with some links from my pinboard account. I tend to pinboard links during the day, to read later in the evening, so it felt like an ideal fit to have them there and ready on the iPad. If you fancy making your own bouncer page, i have popped the code up on my github account, feel free to share and remix. 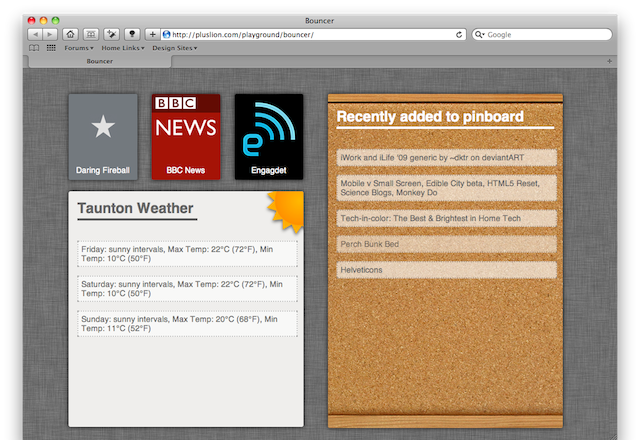 When we built the + Lion site last year, I planned a few sections and one of the planned sections was the blog. However, as often happens in order to meet a client deadline or two it ended up being put on the back burner. So, around 8 months shy of its planned first appearance welcome to the + Lion company blog. Between myself and lion we have a number of blogs already, so why are we choosing to have another? Well, dear reader there are a couple of reasons. The first is to have a single place to consolidate our writing, we have always used the old blog on my personal site (jkg3.com) for posting updates about + Lion and our speaking and presenting, but over time it has become less and less suitable. With +Lion now holding our portfolio it seems that it would be best to move our company and web design related posts here, and to take jkg3.com and turn it into my personal site it was suppose to be. The second reason is that a well written blog, allows for a better conversation with our clients and the industry. We feel we have insights and code to share and this seems like the ideal place to share them. Alongside the occasional post with tips and tricks were looking to post updates and write ups for conferences and events we have attended, or been lucky enough to be asked to speak at. So thats this blog in a nutshell, we hope you enjoy reading it, as much as we enjoy writing it. Jamie is the technical guy, he's been working online commercially since 2003 & in that time worked with numerous studios & clients for both small companies & big brands like Channel 4 & Dogs Trust. More about Jamie. HomeAt a glance, what we do. The BlogWhat we're up to. Our ServicesWhat we do & how we do it.